Turn your cold store into a conditioning room with our unique Tru-fog® process – By filling the atmosphere with a light but visible fog, created with minute droplets of purified water, it enables living produce, deprived of its root system to hydrate. Developed by working closely with international produce growers, packers, processors and shippers, our High Humidity fogging goes beyond normal humidification. Used either on its own or in support of existing cooling systems, our Tru-Fog® makes traditional DX refrigeration more efficient and less costly to run. Crop Hydration for Salad, Baby Leaf and Brassica. For over fifteen years we have specialised in humidification and hydration systems for Post Harvest cooling and storage of salad & vegetable products. Based in England, we now supply most major growers, packers and shippers of baby leaf, salad and brassicas with our unique Tru-fog® Crop Hydration system. Originally retro-fitted into existing cold stores, it is now often specified for new-build stores. In a nut shell, the system first humidifies the air in the cold room to about 95% Relative Humidity (RH) and only then is it able to fill the room with a visible fog, made up of super fine purified water. As our system fills the cold room with fog, the vapour pressure increases and the fog is pushed into every corner of the space. The vapour pressure within the plants is lower than the vapour pressure in the room. The effect is truly amazing – Delicate baby leaf, salads and brassicas absorb these droplets through the stomata in their leaves, conditioning their cell structure and sustaining life in a genuine, natural and organically friendly way. For example, baby leaf, such as perpetual spinach, would normally start to wilt after 2 days in cold storage, depending on weather conditions during harvest. With our system, growers plan to leave product in the conditioning fog for 24 to 48 hours before delivery to the pack house so that it is able to cool to the desired temperature and fully hydrate, usually emerging in better condition than when first harvested. Perpetual spinach, for example, can be kept in better than ‘as-picked’ condition for a total of 11 days, only then will it start to wilt, but no faster than usual. No adverse effect on customer shelf life has been experienced by growers. However, improvements in taste, texture and sugar content have been identified. Brassicas are being kept in better than ‘as picked’ condition for up to 8 weeks and even more when late winter growing and harvesting conditions are poor. The overall benefits to growers of seriously extended post harvest life are referred to as ‘Strategic Cropping’. As a direct result of the development of our unique Tru-fog® Crop Hydration system, baby leaf, salad and vegetable products can now be held in perfect condition for a considerable period of time after harvesting. After harvesting, baby leaf products, are generally not fully turgid and will improve their condition when placed in our Tru-Fog® environment for between 24 and 48 hours. They can then be maintained in better than ‘just picked’ condition for up to 11 days, brassicas for 8-10 weeks and Asparagus for 5-6 weeks before they start to show any sign of ageing. This has enabled growers to harvest when field conditions are good and staff are available. 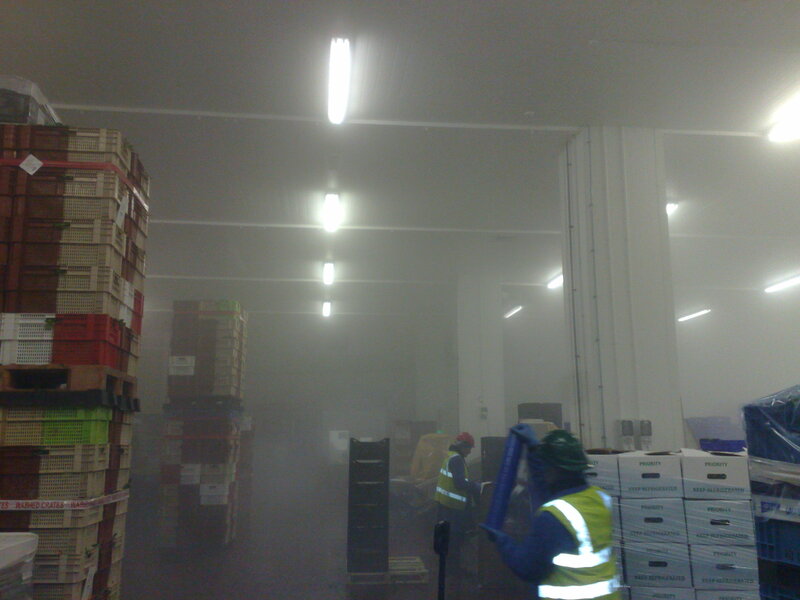 The product can then be cooled and held in a fully climate controlled Tru-fog® cold store until needed. This increased flexibility enables resources to be manage and events respond to, rather than be driven by fluctuating supply and demand. Our Crop Hydration systems are supplied assembled on a palletised container. Overseas customers and UK growers with farms in Spain, Italy and Portugal can ship the container back to the UK at the end of the season for a workshop service, although a number still prefer our engineers to visit their facilities to ensure that everything is working well. The enormous volume of fog that is maintained 24/7 in the cold store is impressive and the >5 micron droplets of super purified drinking water enable the living plants to hydrate naturally and the cell structure to become fully turgid, sustaining life and opening up the opportunity of strategic cropping flexibility. The Pendred Tru-Fog® Crop Hydration system is entirely different from standard humidification. Our system starts to work when the humidity in the room is over 85%. The fog evaporates until the air is saturated and can no longer hold any more moisture. Tests have shown that sugar content; crispness and general flavour is at its best when cells are fully turgid. Professional organoleptic tasters were unable to differentiate between baby leaf product that had been picked within an hour and those that had been stored in the Tru-fog® Crop Hydration environment for 72 hours. Power consumption in these days of high-energy costs is a significant cost factor in the supply of fresh salad and vegetables. An important side benefit of using our system is that approximately 6% less energy is required to remove 1Kw of heat from the product. Cooling within the cold store is achieved more quickly and more evenly through the product. Snow conditions in the UK can cause havoc, especially for brassica growers preparing for Christmas. Those who have a Pendred system, are able to harvest before the snow and hold the product alive and in a fully hydrated condition until December. Harvest when the product is at the optimal specification and leaf size. Harvesting when weather conditions are most favourable. Plan the cutting program days in advance to reduce cost. Health & Safety in the field is improved by cropping in good light and weather. The ability to hold product in the cold store for 10 days. Make up orders to exact weight from product already cut and cooled. No need to re-visit the fields to make up order weight. Increase yield and output through the ability to hold product in ‘as picked’ condition. Eliminate waste due to quality issues such as leaf length, turgidity and ageing. The Pendred Tru-fog® Crop Hydration system has revolutionised our farming operation. We are now selling baby leaf product at up to 11 days after harvest without any Quality issues. If we can, we prefer to hold product for one or two days in our Tru-fog® conditioning cold store as product looks better after two days in storage than it does fresh from the field. We are consistently recording a 10% increase in product sent to processors (same at our other satellite farm) since we installed the Pendred Tru-fog® system. This season we have had absolutely no product wasted due to quality issues. Much greater flexibility and reduced cost in cropping now that we can plan a week ahead rather than reacting to orders received that day. We call this ‘strategic cropping’. For example, since the introduction of the Pendred Tru-fog® system, we cut in advance rather than on the morning of despatch. The despatch weight of product is exactly matched to the order weight, as stabilised product comes directly from the cold room, not the field. Health and Safety is vastly improved as a result of planned work schedule. Costs are reduced, as we no longer have to re-visit the field to make up order weight. We can now cut and store leaf at the optimum or correct size, preventing leaf from growing oversize in the field and being wasted. “There is now a potential to grow and store surplus crop before the latter end of the season when the yields are poor and danger of frost damage is imminent”. “Over production caused by crops bolting can now be held in store and sold rather than being wasted”. “Bunched carrots look better than they did off the field”. “Beetroot has held for months with no loss of quality or weight”. “Broccoli can be held in perfect condition for 5 weeks or more”. “We won’t be able to manage without it!” – (Brassicas, bunched carrots, beetroot). “Broccoli lost 2% weight in three weeks and was in perfect condition, the control sample lost 22% and was not in saleable condition”. “For such a simple concept the results are amazing”. “If bad weather is on its way we can cut and store product before it is ruined on the fields”.